Small Tarts Have Big Hearts! 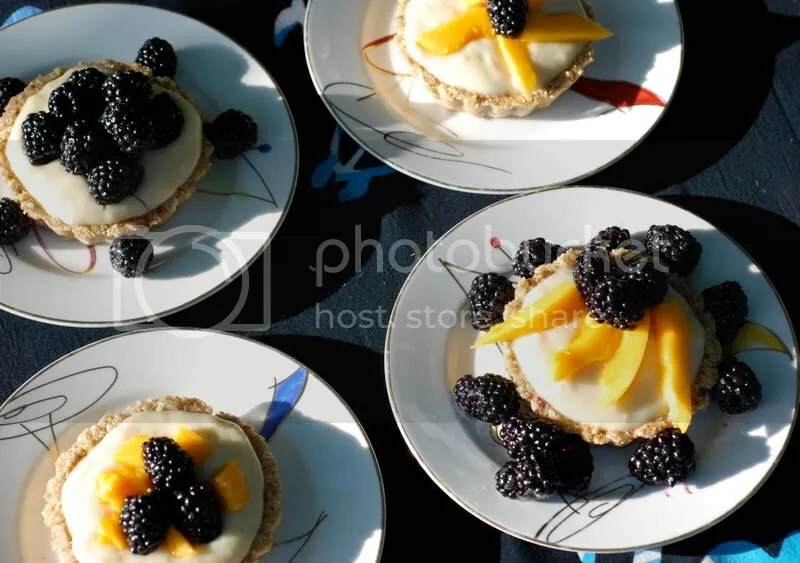 Sticking with foods that say “love” this week, I offer a dessert that may just be the perfect ending to that romantic dinner you have planned for your sweetie this Valentine’s Day: tartelettes. I love things in miniature and these are especially fun because they have a deliciously simple base that you can get really creative with. For the filling I adapted an “old-fashioned vanilla filling” recipe found in the Williams-Sonoma Desserts cookbook. I’ve never made a custard before and was temporarily at a loss as to what could replace the eggs in the recipe without resulting in a thin and runny cruel imposter of a custard. I don’t usually use Ener-G Egg Replacer but I thought that with its potato starch and tapioca flour that it would be just what my custard called for. I wasn’t disappointed – the custard thickened up almost immediately and it turned out beautifully. You may end up with more crust mixture and filling than you’ll need for the tartelettes – this is not a problem. Just roll up any extra crust into bite sized balls and enjoy them as an easy and energy-filled snack. 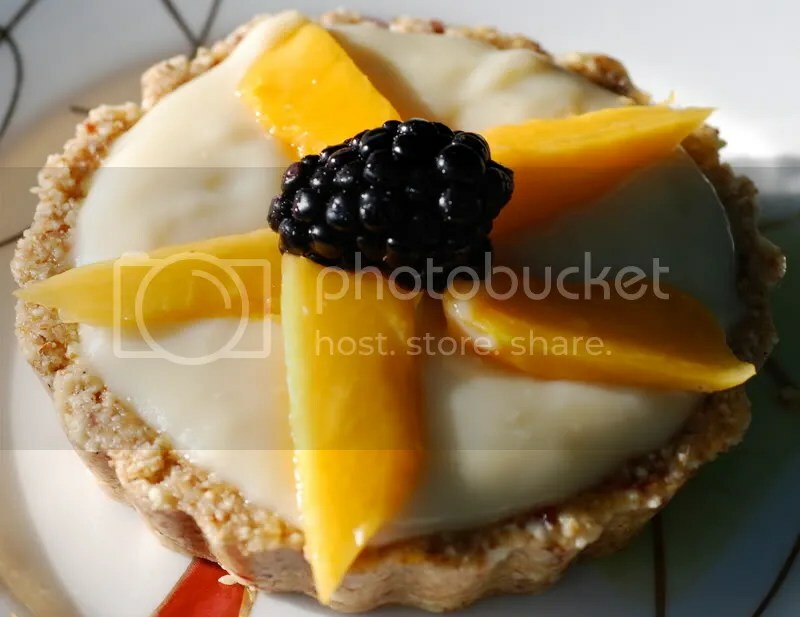 Save the filling for when all for the tartelettes are gone and mix in whatever fruits you have on hand for a quick and easy dessert. Voila! 1. Whisk together the dry ingredients in a small bowl and set aside. In a heavy saucepan bring the soymilk to a simmer. Pour the dry ingredients into the soymilk as a thin stream, constantly whisking so as to avoid lumps. Whisk in the Ener-G “eggs”. Whisk constantly while cooking over medium heat for 7-10 minutes until it boils and thickens. 2. Reduce the heat and boil gently for 3 minutes, stirring constantly. Remove from heat. Stir in the Earth Balance until smooth, and then stir in the vanilla until well blended. Pour into a bowl and cover tightly with plastic wrap, gently pressing the wrap directly onto the surface so as to prevent a skin from forming. Chill for a few hours. 1. Combine all of the crust ingredients in a food processor and process until the mixture begins to ball up. The mixture should stick together when pinched. 1. 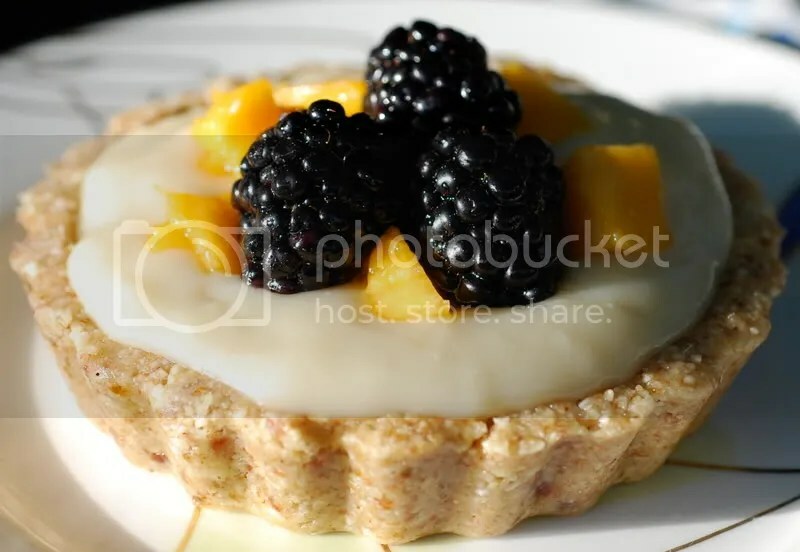 Press the crust mixture into your tartelette pans to create crusts of your desired thickness. Pour filling into each tartelette so that it reaches the rim of the crust. Garnish with fruit and enjoy at room temperature of refrigerate to enjoy cold. 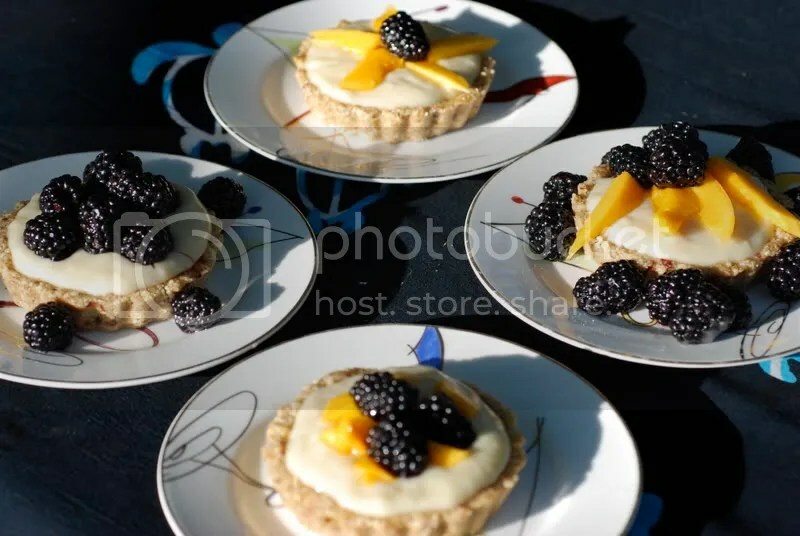 I garnished these tarts with blackberries and papaya but they would be delicious with any berry or tropical fruit. They would also be great with a berry coulis and some fresh mint. Be creative! I am throwing my tarts into the ring for the Valentine’s Day mini tart contest being hosted by The Mini Pie Revolution Headquarters. Technically, I think that these tarts may be a few bites bigger than what they had in mind, but since I wanted to do a no-bake crust using a mini muffin or a cupcake tin was out of the question – there would have been no way to get the tarts out of the pans without making a huge mess of the tarts. Instead, I used my tartelette pans with the removable bottoms to create these cute little guys. Check the MPRH blog on Valentine’s Day to see how my little tarts fared! Hi Gail. I was just wondering how many tartlettes this recipe actually makes? It looks like you got 4 out of it, but I just wanted to be sure. Thanks for the wonderful recipe!! Thank you for stopping by! I made four tartelettes with this recipe but could have made five if I had a fifth tartelette pan. Those are so impressive and beautiful! Way to go! So glad you joined The Revolution! Your tarts looks delicious! These are beautiful my dear. Happy Valentines day!! Gail, these look devine! 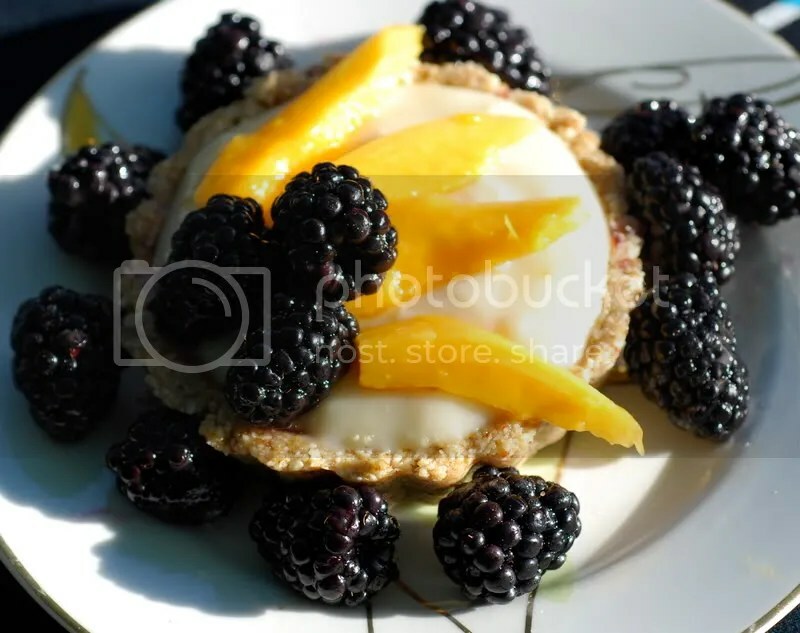 Walnuts, dates, coconut and blackberries – what more could a girl want! 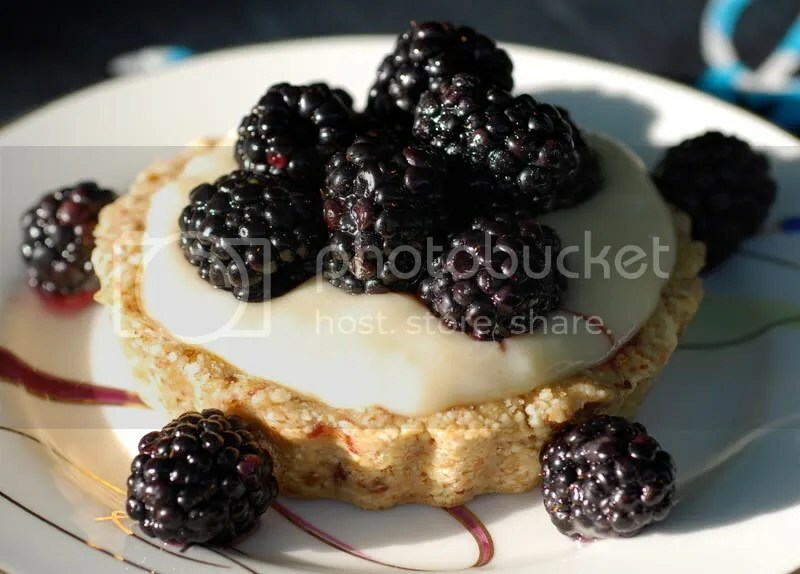 I love mini tarts and this crust recipe looks great. Thanks for posting it! Cakelaw and Emilie – Thank you for the comments!